In today’s world of iPhones, Androids, Tablets, Kindles and other electronic devices that need to be charged, many kitchen counter tops resemble a a plate of spaghetti. But with a little luck and plenty of Kickstarter donors, Life-Spot plants to roll out a highly efficient and universal, multi-unit gadget charging station for the home, office and business. 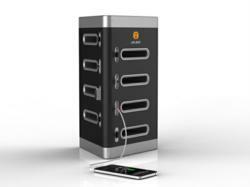 With a beautiful, triangular design, Life-Spot allows users to charge up to eight devices at once and each of its storage compartments has a unique, retractable adapter that serves to connect devices easily and safely while keeping the area organized and clutter-free. With two lightning ports, two 30pin dock connectors and four micro USB ports, Life-Spot can charge anything from phones to tablets, e-readers, iPods, cameras, headsets and other Bluetooth devices, GPS systems, battery packs and more. Life-Spot can also be sat on a table, desk, countertop or even mounted on a wall. Judith and Aaron Altheim, creators of Life-Spot, came up with the idea while hosting their daughter’s birthday party at their house, and found they were surprised about the number of people asking to borrow a phone charger. However, Judith and Aaron only had two chargers which were not compatible with their cell phone models. In order for Judith and Aaron Altheim, creators of Life-Spot, to bring the product to market, they need to raise $50,000 to cover the costs of manufacturing the charging station. The married couple is currently running a crowdfunding campaign on the most popular platform, Kickstarter, in order to raise the necessary funds. Currently, Life-Spot has raised over $8,000 on Kickstarter, but still needs another $42,000 to make it to production. If you’d like to support this project, visit http://bit.ly/Life-SpotKS to learn more, or make a donation in exchange for one of the first products when it hits the market.